The kidneys filter about one-quarter (750-1000 pints) of the blood that is output by the heart daily. This blood is sent to the body's filter treatment plant, where it is purified by the kidneys and circulated on to the rest of the body. Some of the blood flow becomes fluid waste (1/1000th to 2/1000th) and is sent into the bladder for storage until it can be conveniently expelled. This toxic waste is called urine. 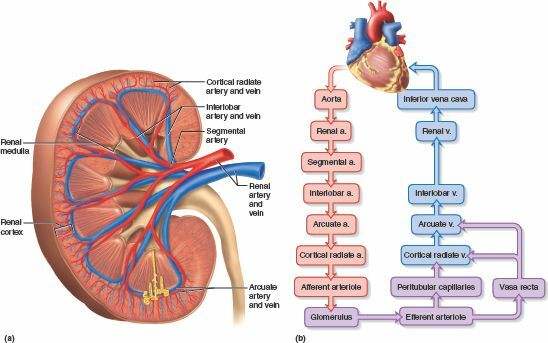 The paired kidneys in the upper part of the abdomen toward the back balance the fluid levels of the body. They balance the body's acid/alkaline nature and the concentrations of salts, minerals and other materials. The blood is filtered, purified, cleansed and adjusted twenty-four hours every day. Hundreds of pints of blood flow through these organs daily, about one-fourth of the heart's output or approximately the body's entire volume. The blood circulates through the kidneys twenty times each hour for purification. About two and one-half pints of this flow becomes urine, although the amount largely depends on our consumption of food and drink, our physical activity and other factors.